Cobá, Cenote Multum Ha, Tulum und Playa Paraiso, Kleingruppe. Die Halbinsel Yucatán ist für ihre archäologischen Highlights bekannt, aber sie alle an einem Tag zu erkunden, kann schwierig sein. 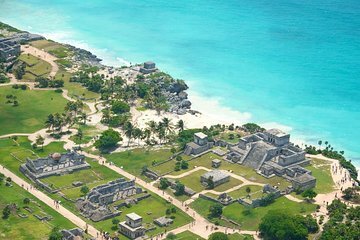 Entdecken Sie Cobá, Multum ha Cenote, Playa Paraiso und Tulum bei einem Tagesausflug von Playa del Carmen aus. Sparen Sie Zeit und suchen Sie einen Treffpunkt mit Abholung vom Hotel und Rückgabe. Genießen Sie die persönliche Aufmerksamkeit Ihres professionellen Reiseführers, wenn Sie auf einer kleinen Gruppe mehr über diese antiken Stätten erfahren. We were picked up from our hotel bright and early by Poncho (guide) and Jorge (driver). We had a small group of 11 people of all ages. There was a reasonable amount of walking on the tours at Coba and Tulum. However we were given the option to rent bikes or taxis at Coba. Poncho was very enthusiastic and knowledgeable about the region and culture. The cenote we visited was one of the quieter ones, and our group pretty much had the whole place to ourselves. A note: although the title of this tour says Multum Ha, we were told that the itinerary was to go to one of the other cenotes, but we were given the choice to go to Multum Ha instead (highly recommended). After Coba and the cenote, we stopped at a restaurant for a buffet lunch, which was fantastic. After lunch we went to the beautiful Tulum ruins. We finished the day with an hour or so at the nearby beach, where there is a bar and food available (try the coco loco!). With driving the tour lasted about 12 hours and we felt that there was sufficient time at each of the stops. Poncho is extremely passionate about the subject matter and made this an exceptional tour! Our long day was a fantastic adventure! Our family two grandparents, son and daughter-in-law, and two young grandsons loved every minute of the trip. We had a marvelous guide Gabriel who knew all the history and lore everywhere we went. I would recommend this tour highly it was by far the best trip of our one week vacation.